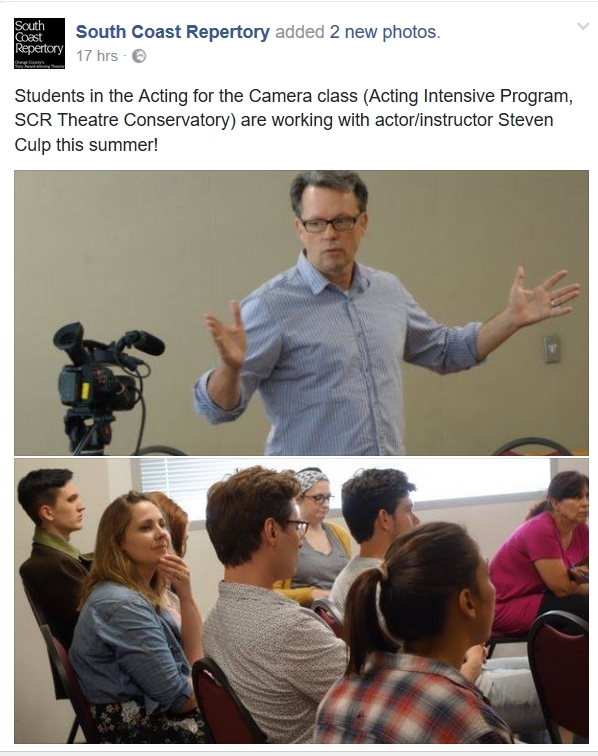 Students in the Acting for the Camera class (Acting Intensive Program, SCR Theatre Conservatory) are working with actor/instructor Steven Culp this summer! 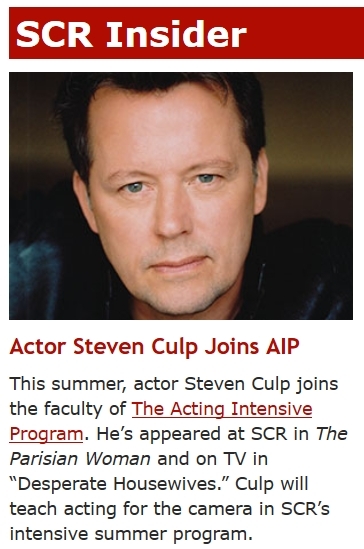 This summer, actor Steven Culp joins the faculty of "The Acting Intensive Program." He's appeared at SCR in "The Parisian Woman" and on TV in "Desperate Housewives." 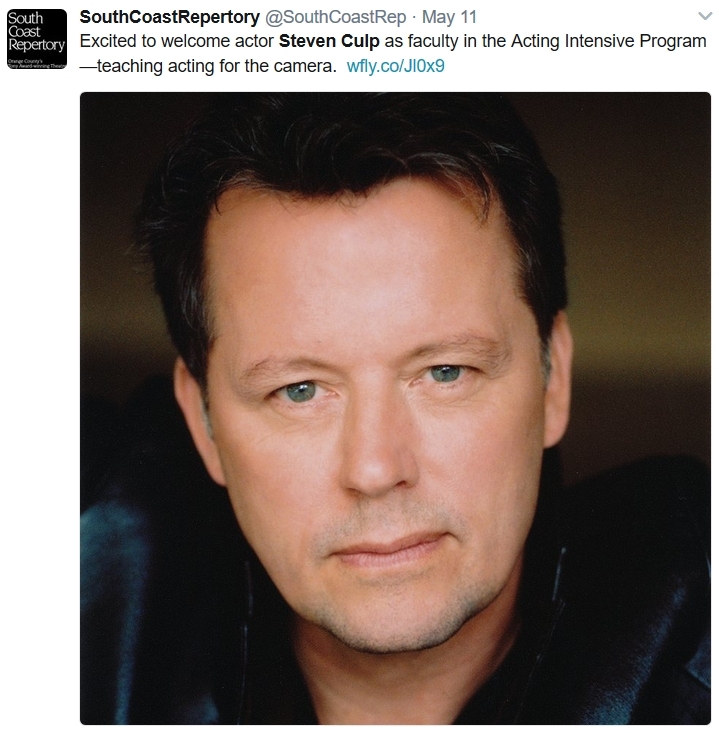 Culp will teach acting for the camera in SCR's intensive summer program. 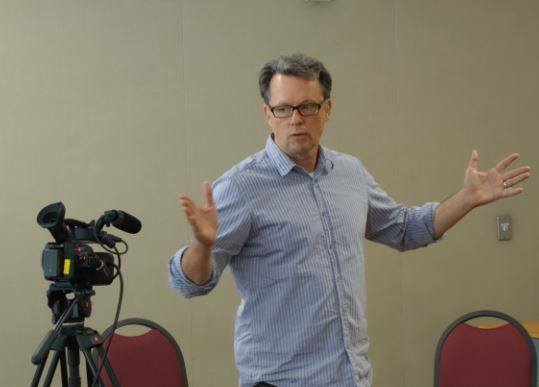 "Excited to welcome actor Steven Culp as faculty in the Acting Intensive Program—teaching acting for the camera." South Coast Repertory's Acting Intensive Program is a nationally renowned seven-week summer program for serious acting students ages 18 and over. In this unique program, now in its 4​​4th year, our faculty of professional working teaching-artists will help you to identify your personal artistic strengths as well as give you guidance on areas that need more focus. For more information please e-mail education@scr.org or call 714-708-5549. The Acting Intensive Program is specially designed for aspiring actors who are ready to bring the tools and techniques of their training into a professional environment. All classes are held in the stimulating environment of Tony Award-winning ​SCR, one of the nation's leading resident theatres. Classes are kept small, and students benefit from a consistent opportunity to work and challenge themselves daily in class. A distinguished faculty of working theatre artists provides the highest quality instruction, including individualized career feedback. SCR's access to Southern California's vibrant entertainment industry allows the program to offer special seminars by distinguished guest artists drawn from the area's rich pool of theatre, film and television professionals. The program culminates in a final performance for invited industry professionals, family and friends in the Julianne Argyros Stage. You may be able to get school credit for this program. Please speak with your school representative. For more information about auditions, tuition, housing, go to SCR's website.